Miami Dice Casino is one of the newest and hottest online operators with a unique theme and unmistakable charm. Instead of taking players on a virtual trip to Las Vegas, the casino promotes the sunny beaches of Miami. The atmosphere is every bit as glamorous and players quickly get in the mood for gambling. NetEnt and Microgaming spearhead the list of software developers, but Blueprint Gaming, NYX Gaming and Leander Games are also featured. The website is easy to navigate, user-friendly and available in several languages including English, Finnish, German, Swedish and Norwegian. The casino is owned and operated by Imperium Network Solutions Limited while being licensed both in Curacao and the United Kingdom. Plenty of promotions are available to those who have accounts here and newcomers are welcomed with tempting offers. Slots are at the core of the Miami Dice game collection and some of them are enhanced by progressive jackpots. Miami Dice Casino encourages those who dream big to seek those life-changing winnings here in the category reserved to these particular slots. NetEnt and Microgaming have produced thousands of such games and the most lucrative ones can be played here. The list of Miami Dice Casino games is long but Mega Fortune, Hall of Gods, Arabian Nights, Geisha Wonders, Mega Joker, Triple Jackpot, Tiki Wonders and Icy Wonders are definitely worth mentioning. Blueprint Gaming, NYX Gaming and Leander Games have a couple of progressive jackpot slots of their own. The difference is that these prizes are won locally, which translates into less competition but smaller amounts. As far as players are concerned, Miami Dice Casino jackpots provide them with a clear alternative so they can make an informed decision. Miami Dice Casino games can be played on the move, thanks to their complete compatibility with mobile and tablets. Players owning devices running on various operating systems can use them to play Starburst, Gonzo's Quest, Aloha, Secrets of Atlantis and many other slots. Top-tier video slots such as Guns 'n Roses, Warlords: Crystals of Power and Mötorhead are also included. The casino offers an impressive selection of Baccarat, Blackjack, Roulette and video pokers for those who want to take a break from slots. Not only are these games available to mobile users, but they can also be played against real dealers. The current selection of games includes different types of Live Roulette, Baccarat and Blackjack. On the list of mobile-friendly games we also find scratch cards and Keno. 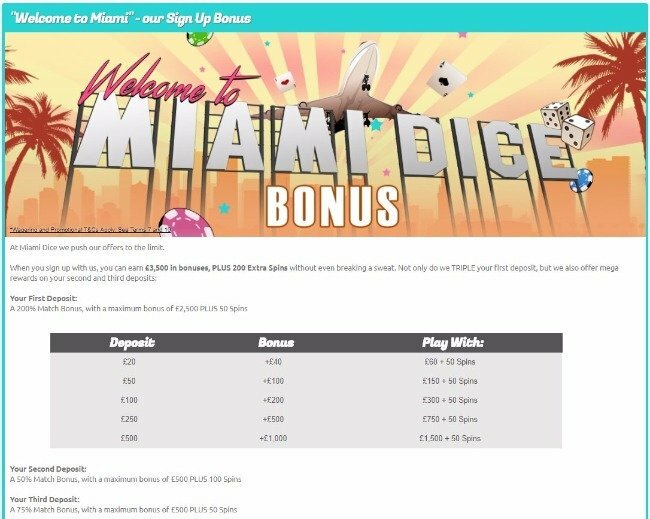 Miami Dice Casino bonuses are some of the most generous one can find online, while newcomers are eligible for as much as £3,500. 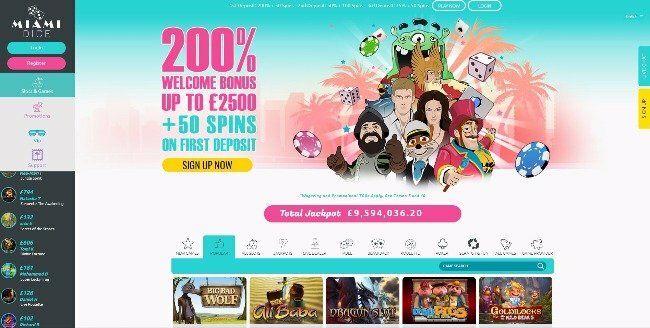 The initial package is impressive on many levels and players also have the chance of receiving as many as 200 free spins. Not only the 1st deposit is subject to a Miami Dice Casino welcome bonus, but players also have the second and third investment matched. The minimum deposit consists of €20 and the maximum amount is of €500, and all are increased threefold right from the start. Regardless of how much money one deposits, as long as they meet the minimum criteria players will also be eligible for 50 Miami Dice Casino free spins. The second and third deposits will result in bonuses of up to €500 each, but the ratio shrinks to 50%, respectively 75%. 500 free loyalty points are offered right off the bat to newcomers so they can exchange them for real cash later on. Such points are also offered to all those who bet real currency regardless of the outcome of individual gaming sessions. All promotions and bonuses are subject to the same play through demands, so it’s easy to learn the ropes. Players don’t have to worry about reading the fine print because the bonus redeeming process is straightforward and predictable. The initial Miami Dice free spins need to be redeemed on popular games, such as Starburst, Gonzo’s Quest and Theme Park – Tickets of Fortune. 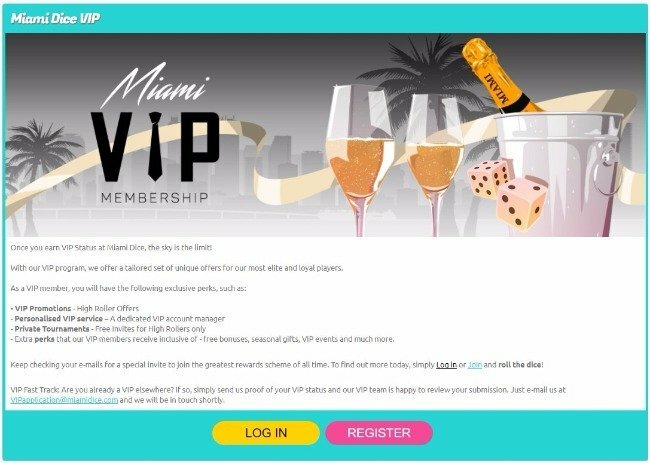 In addition to juicy Miami Dice Online Casino bonuses, players can also claim paid vacations. Miami is the destination of choice, which comes as no surprise given the gambling operator’s name. miamidice.com payment methods should meet all preferences and expectations. Popular credit cards, such as Visa and MasterCard are the top of the list, followed by wire transfers and electronic wallets. Trustly, Giropay, Sofort, PaySafeCard and Dotpay can be found alongside popular e-wallet such as Skrill and Neteller. The latter are faster and the process cash outs in less than 24 hours, but credit cards and wire transfers are reasonably quick at four banking days. Miami Dice online casino customer support doesn’t take breaks and will provide assistance 24/7. Urgent matters can be discussed over the phone or by using the live chat service. Players who need more detailed answers and have more time can use the e-mail service. Our Miami Dice Casino review is quite positive and for good reasons, as the casino strives to meet all demands. The welcome bonus is way above the industry standard and there are plenty of promotions to keep players excited and happy in the long run. With games supplied by reliable and establish software developers, the casino has no problem in satisfying even the most demanding players. They have a solid loyalty scheme, trustworthy payment methods and a customer support team that is professional and always on duty.